23. Goodbye Disposable, Hello Cloth w/ LINKY! I think you look great! It's true that second babies show sooner. It was that way for me too. You look great! I did not mind showing sooner. We love showing off our bellies - such a special time! You look so great and still pretty small. In the beginning, I carried the smallest with my third. In the end, my belly was just a HUGE as the first. I was all belly. There is nothing prettier than a pregnant woman. You are beautiful. Beautiful baby bellies. Congrats again! Oh that's just wonderful, Congrats for making it to the first trimester. Congrats. Lookin great. Happy WW! Congratulations! I love baby bellies! They definitely get bigger sooner each time though. Happy WW! Oooooh, I have the belly envy. And it's official...I have the baby itch. I blame it on you! lol All kidding aside, you look fantastic. That baby bump is downright adorable. Thanks for stopping by and linking up. 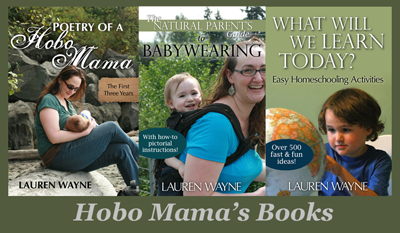 Have a great day, Hobo Mama. Congrats! Crazy the difference between 1 and 2! 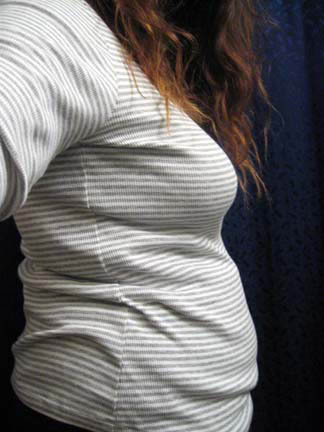 Cute bump! And I think we have the same gray striped shirt :) Is your nausea easing up any now? Hope you're feeling better soon. That second one is a doozy, innit? YOu should have seen me on my 4th! eeeesh. I get so jealous those perfect bellies. Mine always dropped flat at the end. Super cute! Congratulations and good luck. bet the baby will be blonde and gorgeous like the sibs. You look great! Beautiful belly. I was in maternity clothes SO much earlier with my second. It's true you pop out a lot sooner. Yep, you do show sooner, and it is true the more you have. I am 24 wks pg with #6. My belly has popped, starting with #1 at 24wks, then with the others it was 22wks, 16wks, 11wks, and 9 and 8 wks with the last 2!! Makes it hard to hide but is so much fun! Congrats!! 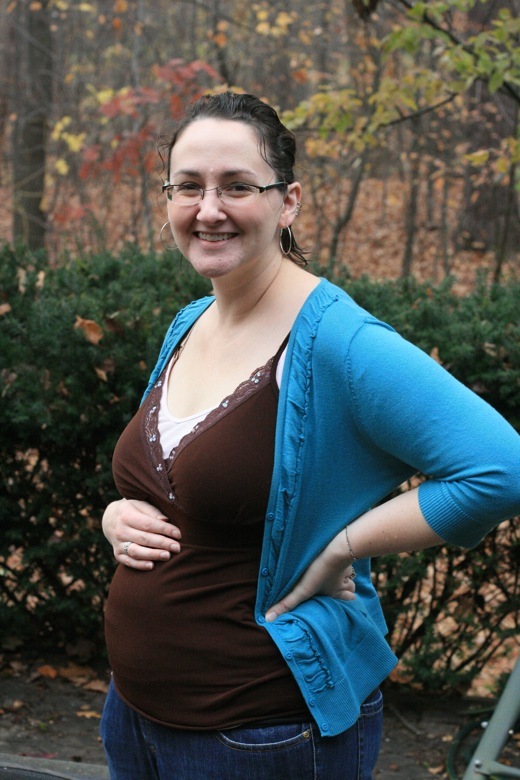 I just entered the 2nd trimester this week and I popped at about 11 weeks! I love it though cause with my first child, I just when through a horrible "I've just been eating too much" chubby phase til about 16 weeks. I didn't look remotely pregnant until then, so I was so embarrassed! This time I actually feel cute and clearly pregnant! By the way, love that sweater! so cute! You definitely show sooner the second time around. Whee, pre-stretched stomach muscles!